Global Warming Got you Down? We're taking action at 6pm, working locally on the climate crisis, prior to this valuable presentation. Fleeing from Wildfire Smoke? Most people can go indoors. But some don’t have it that easy. 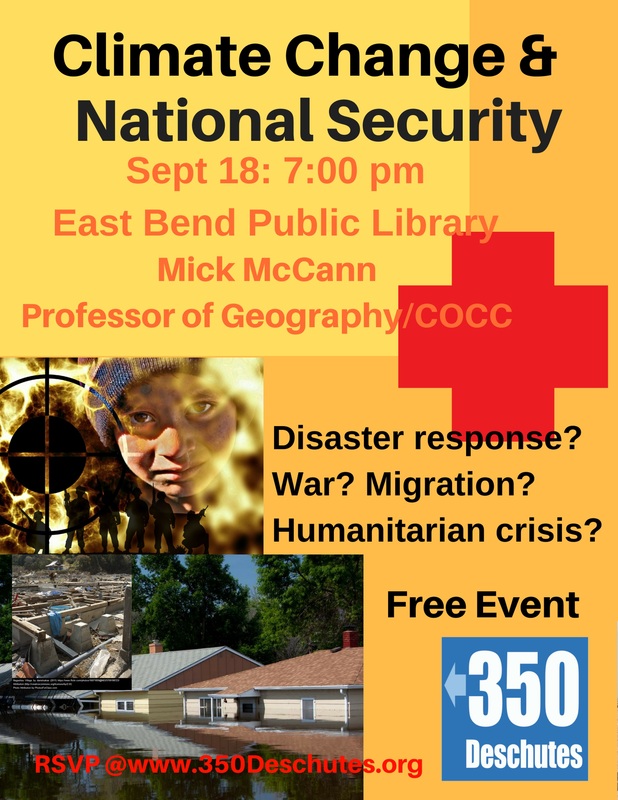 On Tuesday, Septemeber 18, Professor Mick McCann will provide a FREE presentation on how water and food shortages, rising temperatures and other climate impacts will cause migrations that may affect all of us, even our national security. 7 pm, East Bend Library. Come at 6pm to learn what actions you can take locally to encourage climate stability. Hosted by 350Deschutes.